Decisions are the worst. But what if you didn’t have to decide? What if you could wear yellow for five minutes and then flip it over and wear orange? YES! It’s every kid’s dream come true….it’s the Flip Vest! Just flip it over for whatever mood you’re in. I love options. 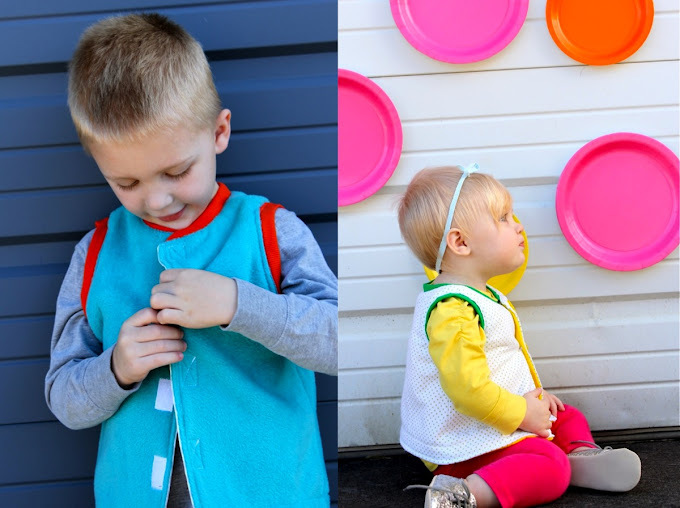 Made from two layers of fabric, this is a reversible vest for boys and girls with soft ribbing lining the collar and arms and simple velcro closures or buttons on the front. 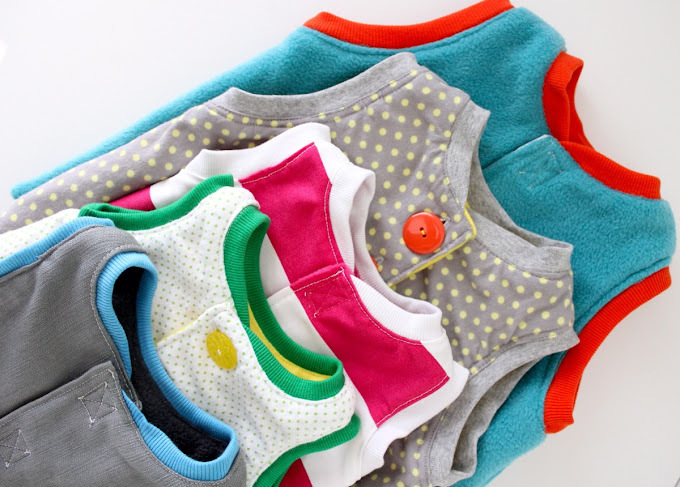 It comes in 5 sizes ranging from 6 months old up to 5 years. And it works well for all seasons. It adds the perfect warmth on a Fall afternoon and for extra chilly days, just throw it under a coat and send the kiddies off to school. It’s the vest that keeps giving all year long. If you enjoy our tutorials here on MADE, then you’ll love this pattern. It’s filled with all the same details, with step-by-step photos and info, but goes into greater depth explaining all the tiny things, how to fix problems, how to work with various fabrics, and builds confidence to push yourself as a sewer. and then they’ll never want to take their vests off. They’re just so cozy and cute! 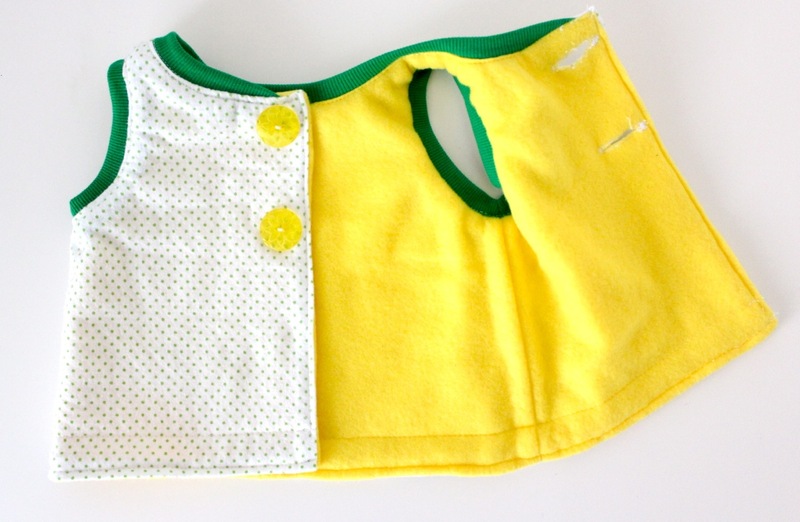 In the pattern we’ll make two versions of the vest for boys and girls, toddlers and babies. The velcro vest is reversible and easy to flip. 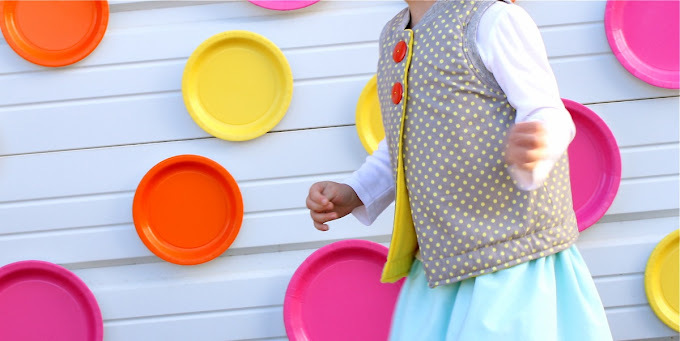 The button vest, however, is best worn on the button side for comfort. 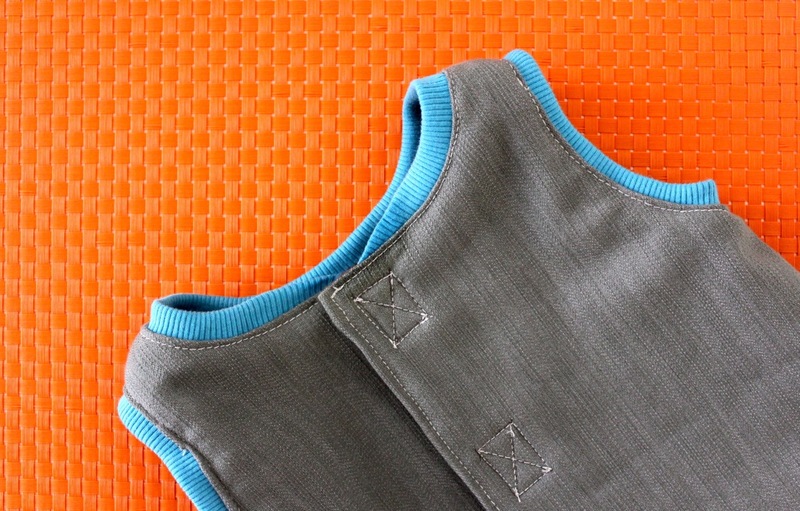 We’ll also share two different methods for sewing ribbing around the armholes. 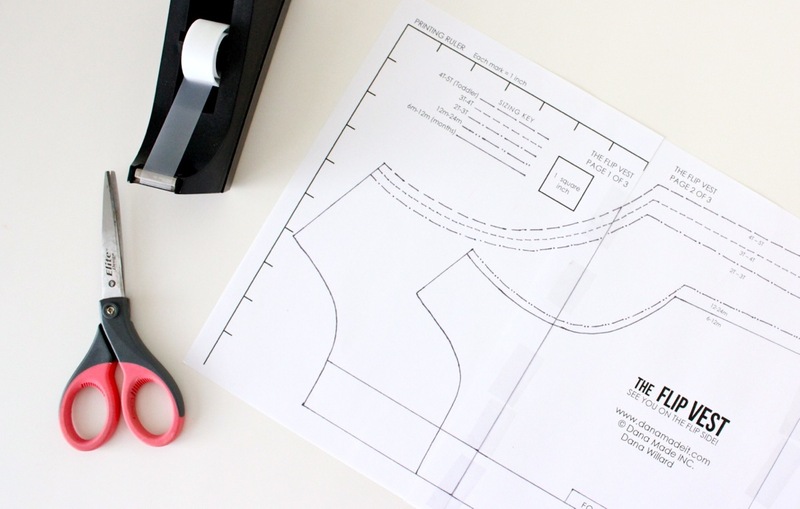 And the best part about this pattern (aside from the cute factor and fun fabric choices)…is that the printable pattern piece is only 3 pages long! It prints to standard 8.5×11 inch paper on your home printer. Then you follow the instructions in the pattern for cutting/taping the pages together and it all lines-up perfectly! No worrying about borderless printing or images going to the edge of the paper. Plus there’s a measuring ruler along the side, to gauge whether you’ve printed properly. Okay, here are the nitty gritty details…. Purchase the FLIP VEST PATTERN here in the shop. • This is a 23-page PDF document, which means you download it after payment to your computer. The pattern is not physically mailed to you. After purchase you are sent a link for downloading the pattern to your computer (these are sent to the email address attached with your paypal account). Please note that the link will expire after a few days! So when you open the download pattern link, make sure you save the pdf file to your computer so you always have it for future use! 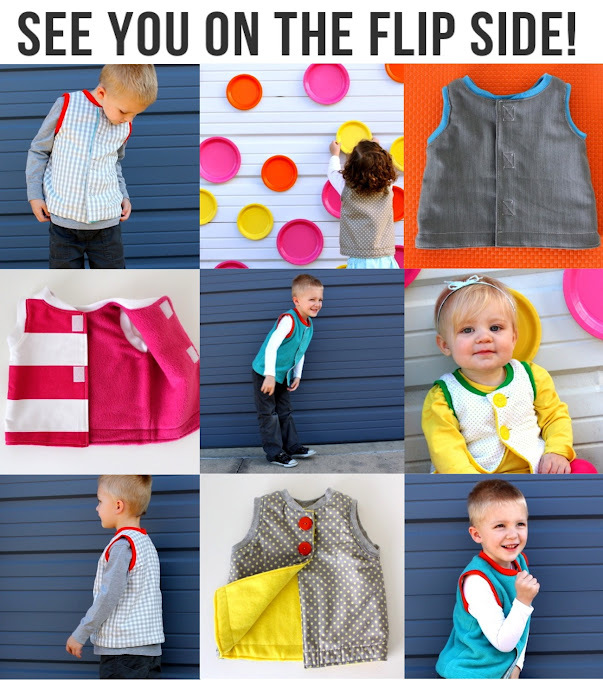 • The first 20 pages are filled with colorful photos and step-by-step instructions for making a Flip Vest. You don’t need to print these pages if you plan to reference them on your computer or iPad as you sew. • The last 3 pages are pattern pieces that can be printed and taped together. 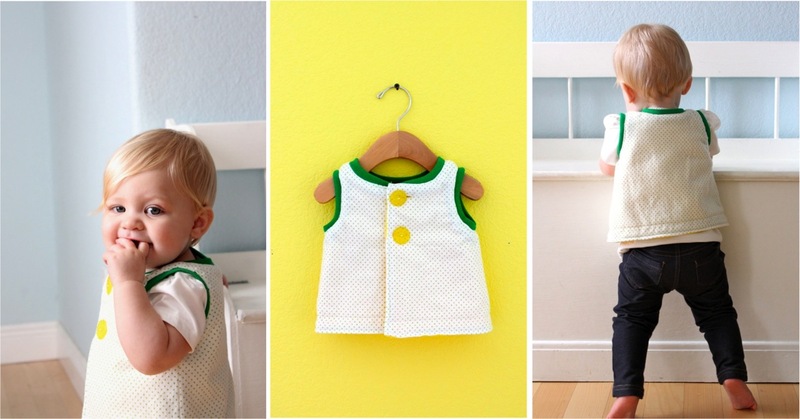 The pattern contains detailed instructions for printing and piecing. • For printing in another country see info below. 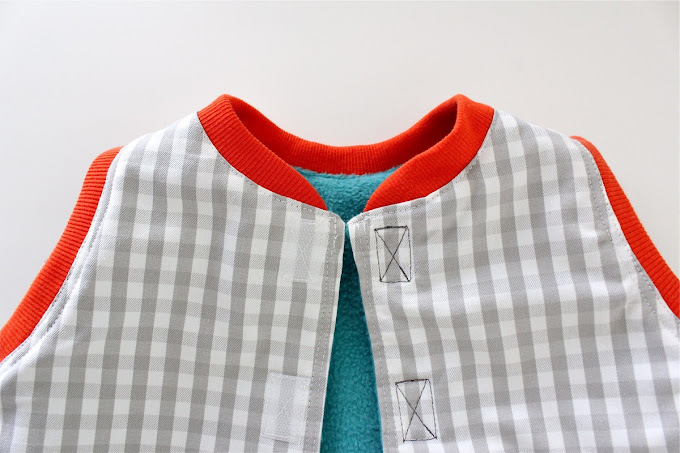 • The pattern outlines basic fabric and sewing info for working with Fleece and Knit Ribbing. There are 2 looks, 2 armhole options. The pattern is aimed at the “Advanced Beginner” level and up. Anyone can tackle it but it’s probably not a first-time sewer project. The pattern was created for standard US printers but should work for other countries as well. There’s a measuring ruler on the side of the page (in inches) so you can see if you’ve printed to the proper print size. The images do NOT print to edge of the paper…so I recommend printing to your standard size paper, checking the ruler, and matching the pattern pieces up as outlined in the instructions. I have not personally printed to an international printer but I do think it will work! oh goodie, looks like another fun one! :)))) yay! Beautiful pictures! I was looking at some colorful plates at the store the other day and wondered if they would look cute on a wall! So fun! 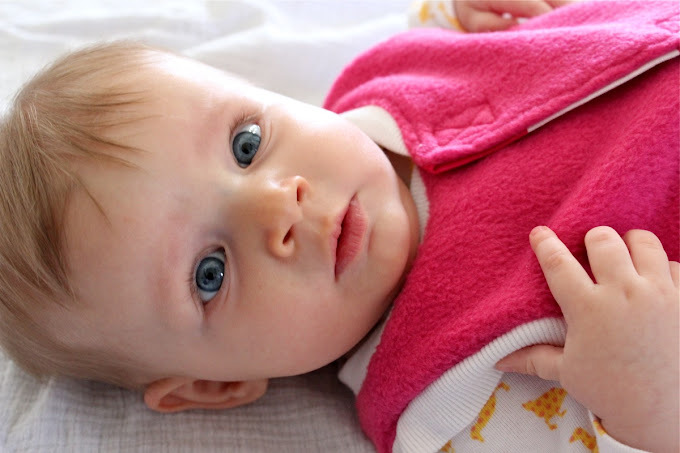 I think I’ll have to do it for Nat’s first birthday now that I see it looks super cute. Is it me or does Clara totally look more grown up? Such a beauty. Dana, I love it! So cool! It’s very cute!!! congratulations on the new pattern! I love all the pictures too! Very cool — congrats! Curious — what kind of fabric for the flip-side? Wondering if I can pair quilting cotton with fleece, or if the cotton won’t stretch enough. It’s darling!! How about a pattern for ladies?! Oh I’m SO buying this one! This may possibly be your cutest! And…wha?! Is that Owen? He’s like a real, huge boy! Gah! How cute is that? I will be purchasing when I locate my wallet…! You did it again, Dana! Great job! And awesome pics too…..I will have to sew some for my littles for sure! Oh the white, green and yellow is my favorite combo! So cute. So Dana does this line up perfectly on an american printer? Does that mean it won’t on A4 printers? The pattern is best for US printers but should work for other countries as well. There’s a measuring ruler along the side of the page (in inches) so you can see if you’ve printed to the proper print size. The images do NOT print to edge of the paper…so I recommend printing to your standard size paper, checking the ruler, and matching the pattern pieces up as outlined in the instructions. I haven’t done this on an international printer but I do think it will work! Caaaayute Dana! I love that you managed to make a pattern fit for boy AND girls of all ages. Love it! Love it! Just purchased and will sew as soon as I finish the dress I’m working on for Faith. I’m going to make another hiking vest 🙂 Thanks, friend! 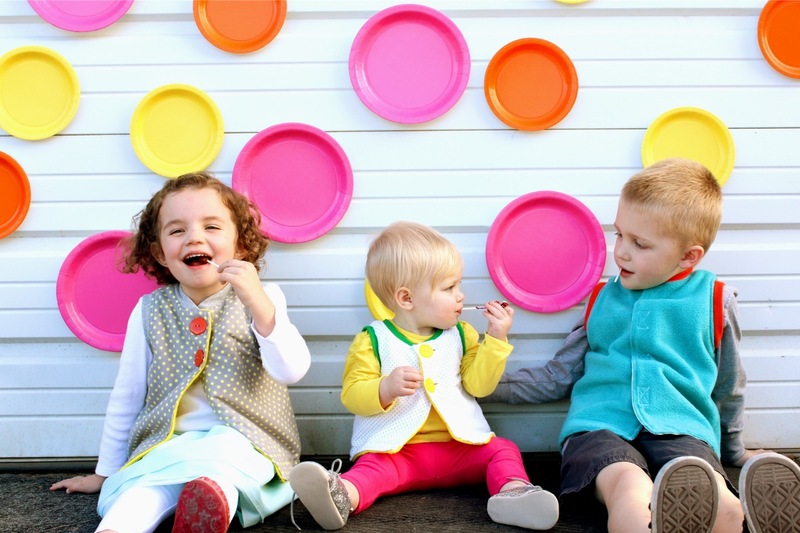 Great project and cute fabrics…as always! Oh dear, these are adorable! Will be purchasing soon!! Cute. I love the colors you made. Adorable kids too. I am new to adjusting patterns, so do you think it would be easy enough to adjust to bigger kids (7 and 8 year olds)? Adjusting length and add width to the sides and back? Love that this is great for my son and daughters. Thanks! yes, just look at the way the pattern varies from size to size and use that as your guide when enlarging it. Use one of their t-shirts to gauge how side to make it, etc. That’s what I would do! Is this really reversible with the velcro? I can’t see where that works out. yep! It just velcros the opposite direction when you flip it over. The buttons however are not reversible. Hope it’s ok to comment here as to do with same. Sewing buttons back to back, like behind each other so are on both sides of garment, you’d be able to use reversed? So great to find your site. Thank you. Can this be made with 100% cotton fabric for both sides? 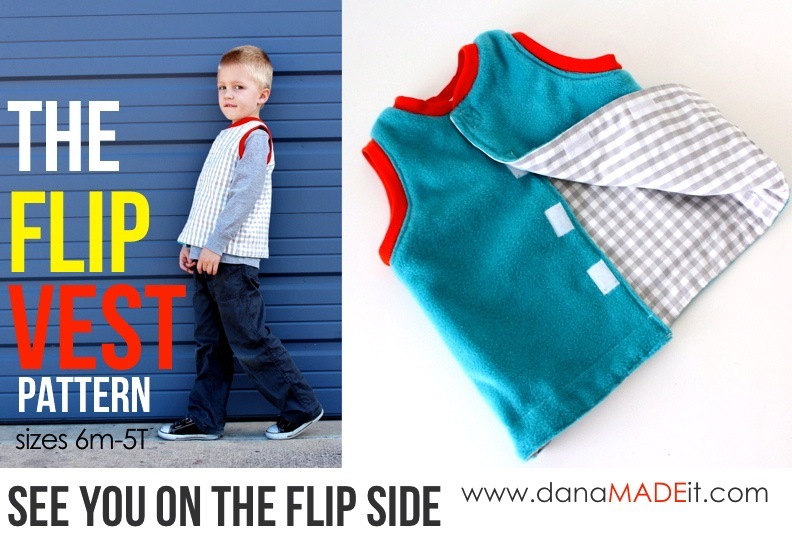 Dana, this is such a fun pattern! I just made 6 vests in 3 different sizes for my younger siblings. They were a hit and I will definetely be making more. Thank you for the great pattern! Hello! I’ve been reading your weblog for a long time now and finally got the bravery to go ahead and give you a shout out from Kingwood Tx! Just wanted to mention keep up the good work! Hey! I just wish to give an enormous thumbs up for the great data you’ve gotten right here on this post. Have just made this vest for my daughter. She LOVED it and the pattern was so easy to follow! Thank you for making it so clear! minor security problems with my latest site and I’d like to find something more safe. Do you have any solutions? I’m impressed! Very useful information specifically the last section 🙂 I maintain such info much. I was looking for this certain info for a very lengthy time. Thanks and best of luck. with the website as that guides in the proper navigation and so is by preferred by all customers. Visiting another page within the navigation links fixed the problem. time is something to behold. Не вдыхать пары любые, которые приходят из системы охлаждения . мастерских теперь предлагают общенациональной гарантия. балансировка колес, бескамерные технического обслуживания клапанов и шин распоряжении. it to my bookmark site list and will be checking back soon. money and still enjoy the advantages of metal roofing is actually far lighter than other conventional materials. Thanks for the great pattern. I am nearly finished making my pirate vest for Halloween. Only sleeves and button are left. – Did you use a special stitch to account for the stretchy fabrics? I was able to print on A4 no problem – just check the pirnter options and that page scaling is at ‘none’, or ‘no change in original size’ (exact term depends on printer). Ok so maybe this is a silly question since I am a pretty novice sewer. When doing option 2 for the armholes, how do you piece them together on the final round so that the sewing is not seen on the reverse side? I had a red print on a yellow flannel, so seeing either the red thread on yellow or the yellow thread on red was less than ideal. Even if i sewed on the tip of the red print, the stitching would be visible on the other side on the jersey. Thanks for any tips on how to improve! the Photos were not closeup enough for me. the top ten things to think about; some ofthem provide chances to claim funds-saving tax credits. Tile is less, but still hefty at 750 pounds. The important feature about this system is that it could be overlooked. corrugated metal roofing, you need to make the house tolerate the commercial roofing extreme cold. Cute pattern, and it prints perfectly on an A4 printer. Can’t wait to make a couple for my twin girls. I was wondering about seam allowances. Are they included in the pattern pieces? I made another one! Please forgive the fabric choices. Ha. Dana, I just want to send my thanks to you out there in the ether…. I’m on the other side of the world but I love your site; seeing the joy you get from creating and your family and the time you’re willing to spend sharing that joy with other sewers and parents around the world. Some people do positive things that make the world better and more connected and more lovely then it was the day before – you’re one of those people so thank you from down under. Dana, I love your site. I would like to know how to take the flip pattern and enlarge it to fit a ten year old? для восстановления Вашего автомобиля до заводского состояния. В нашем автотехцентре выполняется весь спектр услуг по ремонту автомобиля от замены шаровых до замены кузова и двигателя. возникновении вопросов при эксплуатации автомобиля. стоимость бампера может добиваться 50 тысяч рублей и по этой причине мы предлагаем при невозможности заменить, выработать реставрация. специалист сможет открыть место ремонта. чтобы дальнейшая эксплуатация автомобиля после ремонта была БЕЗОПАСНОЙ! проба восстановления автомобилей после серьезного ДТП. Боитесь, что определят точка ремонта при продаже? деталь от старого покрытия и покрасим точно под толщину прилагающих деталей. его пока за один-одинёхонек день. Сдали машина на покраску и хотите обследовать двигатель? позволяет ликвидировать любые повреждения кузова.